Also from the flashes of faces in the trailer, it does look like this is going to be a three-way crossover between Doctor Who, Torchwood and Sarah Jane Adventures – whether it will be brief cameos or something more we’ll have to see, but with that many people, and a load of returning characters from the main series I doubt there will be a lot of screen time for many of them. I actually thought the bulk of the second series of Torchwood wasn’t bad – the non-killing off of Owen annoyed me a bit, but generally the stories were pretty good, indeed the episode last week wasn’t bad, aside from the somewhat amazing fact that Owen – who lest we forget now cannot recover from any injury – somehow walks away from an exploding building without a scratch. What we had in the final episode was pretty much an incoherent mess – dare I say it (and I’m sure the lower expectations I have are something to do with it) but I found that I enjoyed the episode of the critically mauled Flash Gordon that we watched earlier in the evening more than I did this mess. The plot of Exit Wounds was fairly simple, Captain John returns with Gray, Captain Jack’s long lost brother. They capture Jack and cause chaos in Cardiff to occupy the rest of the team. 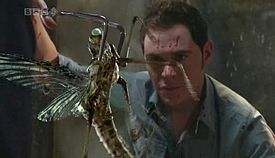 Jack is taken back in time and is buried meaning that he will continually die and resurrect until he is dug up – almost one thousand nine hundred years later he is found by an earlier Torchwood who hide him away, and he reveals himself in time to save the day – however in the process Owen and Tosh apparently get killed. Much as with the uninjured Owen thing last week, the major plot device of Jack being buried really wasn’t thought through. Although Jack doesn’t stay dead, unlike Owen he’s still living – it’s been established that he eats and drinks, and I’m assuming sleeps. He really doesn’t seem to be particularly affected either mentally or physically after nineteen hundred years buried – what’s he been eating all this time? What had happened to Gray was little explained, and strangely enough Gray called his brother Jack despite the fact that we known that to be a pseudonym. Essentially, the whole plot was a mess. After the shock conclusion to Reset, and especially if you’ve sat through Russell T along with various of the other production team members going on about needing to kill a major character (as an aside it was decidedly amusing that all the cast, like me, still associate Alan Dale with Jim Robinson), the fact that Owen is pretty quickly up and about, walking and talking again is a bit of a let down. Having said that, a look at the â€œNext Weekâ€? trailer at the end of Dead Man Walking indicates that as with Suzie last year the resurrection glove is more of a curse rather than a blessing. There is also a comment from Owen towards the end of the episode where he questions whether the other deaths caused as a result of him coming back were worth it, but ultimately the impact of the death of a major character is not explored, and certainly not anything like what is discussed by the production team with reference to the previous episode. Anyway, putting aside the fact that the producers lost, or maybe postponed their nerve in killing off a major character, the episode wasn’t too bad. The plot split broadly into two parts, the first being Owen being gradually taken over by the death creature, then the team hunting the creature as it goes on a rampage through the local hospital. Martha doesn’t get that much to do this episode, other than do the odd medical bit, and then get incapacitated by the death creature, but then it doesn’t take a genius to work out that Owen will be the one that will hold the key – I suspect most of the audience got it a long time before the team did! There were some definite suspension of belief moments – how come nobody has noticed a Church full of sleeping Weevils in the middle of the city? However the episode did provide some amusing moments playing around with the fact that Owen was dead. It will be interesting to see if the ‘no blood’ sequence in the bar survives into the pre-watershed repeat. There was also a little bit of an exploration between Jack and Owen of the fact that one is a character that can never die, and the other is a dead character still walking and talking. I think perhaps the final judgement on the episode should wait until we’ve seen the remainder of the story arc, as it’s pretty obvious that the episode was much more of a piece for the larger jigsaw.